Adults and children who have allergies to peanuts may have mild to severe allergic responses, if peanuts or any byproduct of peanuts is ingested. The onset of an allergic response to peanuts comes on very quickly. If you are allergic to peanuts, and you ingested something with peanuts or a peanut derivative in it, you will have an allergic response. To put it quite simply, after you have ingested a substance you are allergic to, your immune system will immediately produce antibodies, which also triggers the production of protein molecules, called histamines. The histamines are responsible for the allergic response by causing inflammation of the tissues and constriction of smooth muscle. The result of smooth muscle constriction may cause your airways to close up, and anaphylactic shock could result. 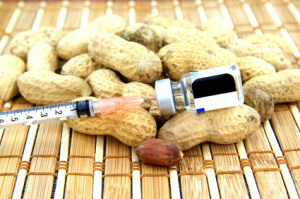 Some individuals with peanut allergies have asthma attacks that are brought on by a histamine response to peanuts. The airways close up enough to make breathing labored, and heavy wheezing results. It is the constriction of the smooth muscle, caused by swelling, in the tiny branches in the airways of the bronchial tree that causes the wheezing. If your trachea, or any part of the bronchial tree were to close completely shut, you would not be able to breathe, and immediate action must be taken to save your life. The introduction of an antihistamine into your body will neutralize the histamine, which causes the allergic response. If you or a family member has a severe allergy to peanuts or any other substance, your health care profession will likely prescribe a self-dose epinephrine injector pen. The Epi-pen is the most commonly used injector pen to reverse a severe allergic response. If you have an allergy to peanuts, you have to read food labels before purchasing. Even a trace amount of peanut powder or peanut oil could induce a severe allergic reaction. You should wear a medical alert bracelet that will speak for you, in the event you are unable to speak for yourself. Just as with other food allergies, when you eat out, you will need to let people know you are allergic to peanuts. Don’t assume that your friends will remember that you have an allergy to peanuts; you must be proactive and tell them. You, being an adult, can avoid contact with peanuts and peanut byproducts; but how do you protect your children when they are out of your line of sight? As a parent, you may worry that one day you will kiss your child goodbye on a school morning, and never see your child alive again. Teachers, lunch personnel and other school faculty should be made aware of any allergies that your child has. If your child has a peanut allergy, your child must be safe from ingesting anything made with peanuts. 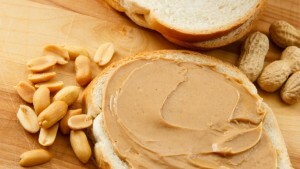 Many schools offer peanut butter sandwiches to kids as an alternate food. As a parent, you should find out if the school your child goes to serves peanut butter sandwiches and peanut butter cookies. If foods with peanuts are served at your child’s school, there is always the possibility that your child is accidentally exposed to peanuts. Some parents send their kids to school with a packed lunch; just to be sure their children with peanut allergies are safe. You can’t even count that a slice of cake served in school is safe for your child to eat, because it might have peanut oil in it. Because you have to be so careful, when you or your child has a peanut allergy, it could take hours reading the labels of every food item you pick up. You have to think of other things besides peanuts, when you have a peanut allergy. You also have to be careful of soy, because many people who are allergic to peanuts are also allergic to soybeans and anything made with soybeans. Almost anything you pick up will have either peanut oil or soybean products in them, so if you are going to have any baked goods, you should bake them yourself from scratch to be sure that the food is safe for you and your family members who are allergic to peanuts. Can An Allergy Trigger Asthma?